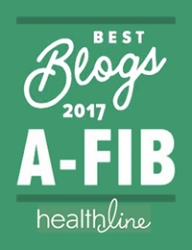 Many A-Fib patients want to monitor their heart rate when exercising or when performing physically demanding activities, i.e., mowing the lawn, loading equipment, etc. 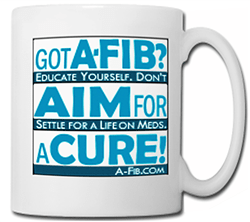 (I wore one when I had A-Fib.) A consumer ‘DIY” monitor or Handheld ECG monitor may meet this need. Used by runners and other athletes, this basic model has a clear, LARGE number display of your heart rate (as number). The included Polar T31 chest strap picks up the electrical signals from your heart and transmits to the wrist watch. Simple one-button start. With ‘Getting Started Guide’; Band size: 8.5 “ from last hole across band to plastic just before buckle. Price: around $28. A more advanced Polar model. Water resistant. Many built-in fitness features in addition to displaying your heart rate as a number (not a tracing). The included H1 heart rate sensor chest strap sends a continuous heart rate signal to the wrist watch. Price: around $88. Also look at Polar FT4; in colors. Bluetooth-compatible heart rate sensor chest strap; Pair it with an app on your iPhone, iPad and Android device (instead of the Polar wrist watch). Price: around $49. For ECG tracings. 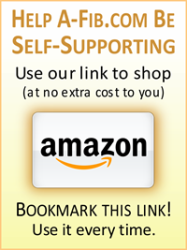 Works with smartphones and tablets. Records and displays an actual medical-grade ECG in just 30 seconds that you can share with your doctor. Kardia shows whether your heart rhythm is normal or if atrial fibrillation is ‘detected’. 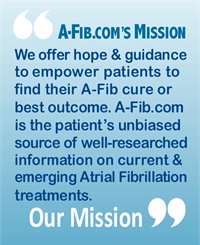 See our Oct 2016 review: http://tinyurl​.com/Kardia-rev​iew-a-fib-com. Price: about $99. 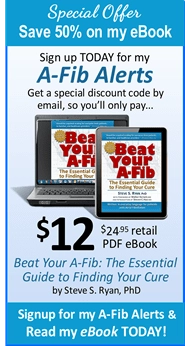 For ECG tracings & more. Stand alone unit captures and displays actual ECG and other vitals in less than 20 seconds. Palm-size, slips into your pocket or purse. Wireless, syncs with your Android or iPhone. More than just heart activity, set goals with daily reminders, etc. Price: about $289. 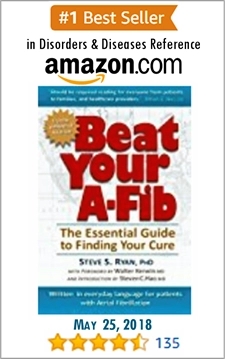 Many A-Fib patients also suffer with sleep apnea. An easy way to check is to measure your blood’s oxygen level, just insert your finger. A reading of 90% or lower means you should talk to your doctor, you may need a sleep study. About $13. For more information about these monitors, see my Guide to DIY Heart Rate Monitors & Handheld ECG Monitors (Part I). To learn how they work, see DIY Heart Rate Monitors: How They Work For A-Fib Patients (Part II).